The Drayton Wiser Multizone kit 2 two channel thermostat system with two radiator thermostats. Suitable for conventional boilers (Regular or System). Control your radiator thermostats, hot water, or room thermostats via the Wiser Heat App. Add more Wiser radiator thermostats to create more independent zones. 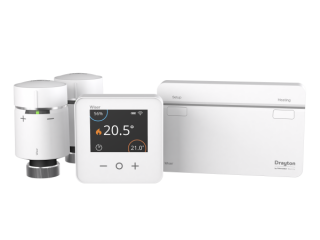 The Drayton wiser Heat Hub is considered the brains of the system, giving smart functionality of up to 3 channels, 16 zones and able to connect up to 32 devices able to attach to the system. The Drayton Wiser Heat Hub operates as a Wi-Fi access point, allowing local app access while at home even without an internet connection. To keep up to date the hub receives firm ware updates via the cloud using your Wi-Fi internet connection. Can I use Wiser Heat with my existing heating system? Wiser Heat have been designed to be compatible with most common boiler types and brands, however is not suitable to work with gravity fed systems or boilers which require manufacturer specific control to operate. What Happens if My Home Loses its Internet Connection? Don’t worry, if your home loses internet connectivity your Wiser Heat will continue to work as normal. Unlike most other smart thermostats while at home you can still use the mobile app to control the temperature at home. All wireless Wiser devices require 2 x AA batteries which need to be changed approximately every 2 years.